My second real prop that I made was my leering skeleton columns. 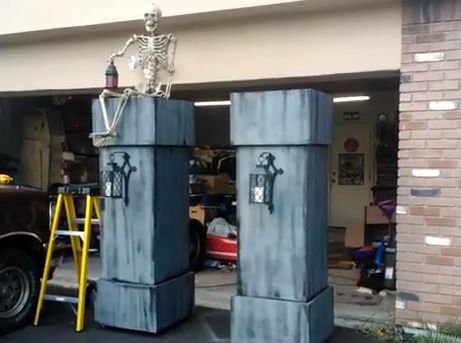 I had seen a few people do the leering skeleton on tombstones and I had already wanted to make a set of columns to put out front so I thought it would be neat to combine the two. I used a rotisserie motor to give the skeleton movement but sadly it didnt last throughout the night before burning up. I will have to find a better way of creating the movement this year. Once I re do the motor setup I will be sure to post a new video showing how I did it.